The Charleston condominium in 2 sentences: Situated along the main strip of the Clarendon-Courthouse neighborhood, The Charleston’s location is its greatest asset. Boasting one bedroom + den layouts as well as two bedroom floor plans, The Charleston’s reasonably-sized layouts and handful of amenities make it an attractive choice for those looking in the Courthouse and Clarendon neighborhoods. The Charleston condo community is located at 2400 Clarendon Blvd in the middle of the Courthouse neighborhood. It has been a staple of the community since its inception in 1991. Sitting at 10 stories and 168 residences, it is a high-rise community however it is well below 200 units and not overly-crowded with residents. The Charleston has average amenities. There is front desk staff, a community room, an outdoor pool, and a fitness center. It should be noted that the outdoor pool is on the small side. Which makes the fitness center bordering on the tiny side. ‘The Charleston’ room is one of the nicer community rooms in the area. The decor inside The Charleston community is also a bit dated. We would like to see some upgrades as The Charleston Arlington is approaching its 25th year anniversary. The condos will all have a sunroom or a balcony; most likely a sunroom. One bedroom floor plans start at 605 square feet, however, only one tier (the 12 tier), has this layout. All other one bedrooms will be at least 760 square feet. One aspect that sets The Charleston condominiums apart from other Arlington condos is that if you exclude the 12 tier, all of the one bedrooms will actually be one bedroom and den floor plans. And once you factor in the balcony or sunroom, your one bedroom condo has now turned into a one bed + den + sunroom/balcony to give you two extra rooms for storage, a home office, or something of the like. With square feet and rooms always at a premium, this is a crucial tidbit of information when you are looking at condos for sale at The Charleston. Two bedrooms will start at about 900 square feet and will go up to 1,020 square feet. All two bedroom layouts will have two baths. Kitchens usually have a serving window into the dining room. Since open kitchens have become all the rage recently, we are starting to see more renovations to kitchens in The Charleston. For the most part, kitchen layouts are going to be a little more closed-off than some would like. 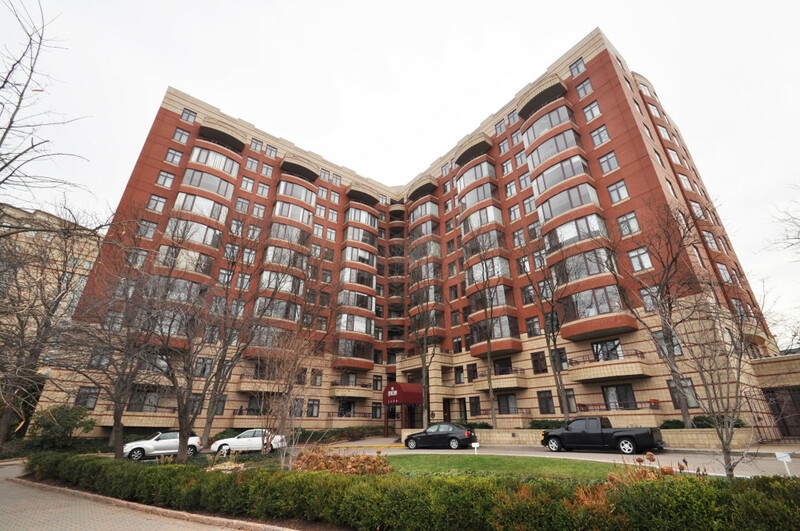 The best part about living at The Charleston condominium is the location (2400 Clarendon Boulevard). Also, there are good views from the north (looking out over Clarendon Blvd) and the south (the ‘neighborhood’ view) that are unobstructed by high-rise commercial buildings, or worse, high-rise residential buildings where you may be looking into someone else’s apartment (and vis-a-versa). The extra space for the sunroom/balcony, the pool, and the overall friendly ambiance in the community are also big plusses of living at The Charleston. The negatives about living at The Charleston Arlington VA is that it is a bit dated. The lobby is a bit older. The hallways need work. In addition, the amenities are small. The fitness center has room for maybe four people. The floor plans are standard. Nothing exciting to see. There is one 3-bedroom unit (or 2-bedroom + den + office) that used to be two separate units and has since been combined. That condo at The Charleston is the best in the building. But other than that, square feet is hard to find. If you are looking for more than 1,100 square feet, The Charleston is probably not for you. That being said, The Charleston is decent. One bedroom floor plans that will all have a den (except for one tier) and two bedroom layouts that will all have two bathrooms are not common, and will set The Charleston apart. So if you can handle smaller amenities, a lobby that needs to be renovated (or, will be renovated soon? ), and floor plans that won’t excite you, but will get the job done, then The Charleston should make the cut on your list as you look at condos for sale in Arlington VA.